Road Safety Authorities and non-government organizations place much focus on road safety and the younger generation - but often neglect the older road users. The group of elderly road users is getting increasingly larger and our road safety strategies should pay more attention to the possibilities and limitations of this group of road users. In the coming decades, the number of elderly road users will increase considerably and so too their fatality rate in traffic. When involved in traffic crashes the risk of severe injury is considerably higher because of their physical vulnerability. We need to discuss road safety and the risks to older people and recommend measures to enhance the safety of these road users! Every fifth person killed on roads in Europe is aged 65 or over - it is estimated that by 2050 one death out of three will be an elderly person if their safety level does not improve. The elderly are more likely to be severely injured or killed in a crash. The fatality rate of the 65-74-year-olds is about twice that of the 30-64-year-olds. The fatality rate even is eight times higher for the over-75s. With the same impact force, the death rate is approximately three times higher for a 75-year-old motor vehicle occupant than for an 18-year-old. The physical vulnerability has the severest consequences during 'unprotected' journeys such as walking and cycling. Older drivers find it more difficult to judge the speed and intentions of other drivers. From the age of around 45, most of us need glasses to see well either at a distance, close up or for both. For example, by around the age of 60, our eyes will normally require three times more light to see as well as when we were aged 20. The fatality rate of elderly drivers is considerably lower than that of elderly cyclists and pedestrians. Who do we regard as elderly/old road users? This is not something to be judged with reference to an exact number of years and days! We often refer to elderly road users as people of 65 years and older. Rigid age boundaries do not take into consideration the fact that ageing is a process that does not start at the same age for each and every individual, nor does it progress at the same pace. We need to acknowledge that there are large differences in driving skills between people of the same age, as well as in their physical and mental abilities. Some 85-year-olds are in better shape than certain 40-year-olds. Why does the older age group pose a significant road safety risk? Are there specific factors that impact on their safety? 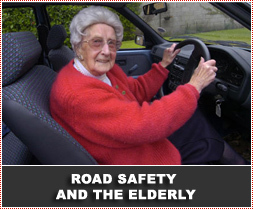 The road safety of elderly road users is determined by two factors: functional limitations and physical vulnerability. Ageing is most likely accompanied by the slowing down of observation, decision making, and movement processes, and a decreased capacity to carry out more than one task simultaneously. Ageing also manifests in a decline or slowing down of movements, a decline in muscle strength, a decline in the finely tuned coordination, and a particularly strong decline in the ability to adapt to sudden changes in bodily position. In traffic where there is the pressure of time and the necessity of dividing one's attention, this can have negative road safety consequences. Sudden movements more rapidly cause loss of balance and falling among the elderly. Functional limitations do not automatically cause unsafe traffic behaviour as older road users compensate through other characteristics, such as insight in their limitations, experience and changes in behaviour. The increased physical vulnerability brought about by ageing contributes to crashes having a worse outcome for the elderly. Increased physical vulnerability, like for instance osteoporosis, is the result of biological processes which makes people more sensitive to external forces, such as a crash. The physical vulnerability has the most severe consequences for unprotected modes of transport such as walking and cycling. Physical vulnerability also influences the injury severity of drivers. Letting go of their vehicles is often a traumatic experience for the elderly - seen as a farewell to part of their social lives. Not all the elderly pose a disproportional danger to other road users. They are more often severely injured themselves (killed or hospitalized) in a collision with other motorists than that they, as a motorist, cause severe injury to another road user (drivers or other types of road user). Studies have shown that the elderly more often choose to drive during daytime and dry weather. The elderly on average have a great deal of driving experience which gives them the ability to anticipate possible problematic situations. They display a diminishing desire for excitement and sensation when getting older. Family members and physicians should be proactive in ensuring the safety of their loved ones on the road, especially if they are afflicted or impaired with a condition that may hinder driving abilities. Important infrastructure features stand out by means of good lighting and markings rich in contrast. Barrier fencing, guardrails or other aesthetic restrictions in shopping areas where there is a high conflict between vehicles and pedestrians should allow access to the road only at formal crossing points etc. Car-free pedestrian zones and traffic calming treatments could be designed to re-direct or slow traffic in residential areas and in town centres where there is high pedestrian activity. Car manufacturers are developing vehicles with a focus on older drivers’ limitations, physical vulnerability and requirements. Protection devices such as helmets for cyclists and (light-)moped riders, and seatbelts and (side) airbags for motorists, can limit injury severity. Technical adaptations available include servo-assisted steering, an automatic gearbox, and adjustments of the power needed to press down the brake and/or acceleration pedal. These are systems that offer specific support for motor functional limitations, such as the decline in muscular strength. Education can include programs to encourage people to walk and training people to walk safely. Education should be focused on altering human behaviour and attitudes. Education and information meetings are important to inform the elderly about the functional limitations that go with ageing, and the aids available to continue driving a car safely for as long as possible. These meetings could offer an opportunity to educate about changes in traffic situations and rules, and about problem situations that they could come across and how to deal with the best. What advice can we offer to our elderly road users? Many occur in complex road environments such as on undivided roads, on a roadway in a busy location, and when vehicles are reversing. Most common types of crashes were reversals, where the pedestrian expected the driver to stop or alter their course, where the pedestrian thought the vehicle was not moving, and where the vehicle came behind a corner or parked car. Errors in judgement include judgement of when to cross the road safely, judgement of the speed or course of the vehicle and unwarranted expectancies about the behaviour of drivers. Make sure drivers can see you - wear something bright. Recognize that many traffic changes have occurred and there is increased heavy traffic and congestion on the roads. Take extra care at night or in bad weather - and try to avoid driving at these times if possible. Plan ahead - This will reduce stress levels - and planning the route in advance will help the driver cope better with the journey ahead. Travelling is tiring and drowsiness and tiredness can lead to accidents. Pamper yourselves by taking frequent breaks during their journey. Check with your doctor or chemist about the effects of any prescribed or purchased medicines as they can affect driving. May we not neglect our elderly road users and strive to address their road safety needs!